Penne pasta is a classic dried pasta shape, structured as a tube, much like ziti. Dried tube pastas tend to have ridges on the outside so that they can grab on to the pasta sauce and adhere to it. This pasta shape is a straight tube, cut off at each end in an angle. Italian manufacturers tend to use copper machinery to cut and form penne pasta. One serving of penne pasta is 2 ounces, equal to 1/2 cup of dry pasta or 1 cup of cooked pasta. Two ounces of penne contains 200 calories. 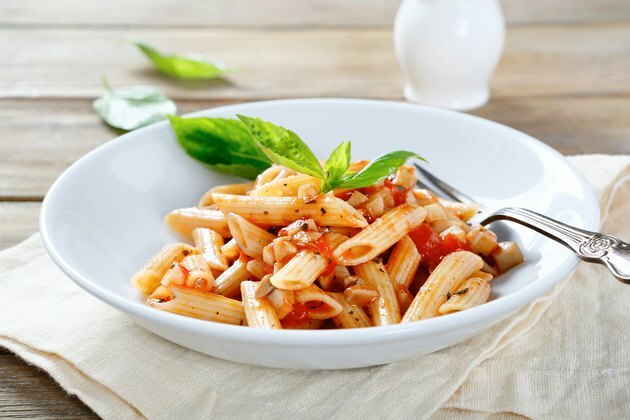 Carbohydrates contribute 168 calories to a serving of penne, making up 84 percent of the calorie content. Nine calories in each serving of penne come from fat. Protein makes up 23 of the calories in 2 ounces of penne.